Yesterday much of central and eastern Australia was covered in yellow dust. 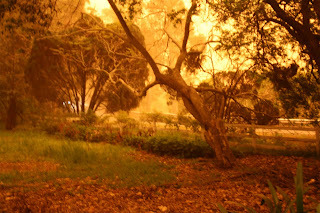 The sky was yellow or orange, visibility was very poor and while there was something very beautiful about it, there was also a strange other-world-ish feeling about the day. However, we woke today to bright blue skies, the savage wind had dropped and water restrictions were lifted for a day or so to give everyone a chance to remove the yellow dust from every possible surface. Even the plants in the garden had to be hosed off. 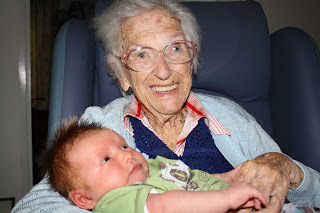 Great Grandma Lina, aged 93, with young EJ, aged 3 weeks. They seem pretty content with one another. A set of sample books I've made for the 'shop'. 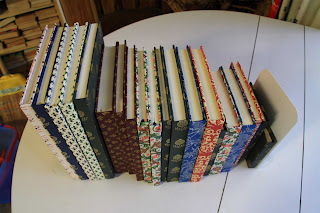 These are journals, recipe books, 2010 diaries, address books and guest books. They were well received so I'll be making a lot more before Christmas. I've bought a new camera (a Canon digital SLR) and so far I don't seem to be doing much better at taking photos than I did with the little point and shoot. Maybe I need to read the manual and watch the DVDs that came with it. That will be on my to read list when I go away for a few days next week, bird watching and doing absolutely nothing. wow Carol that photo is eerie! I've noticed our sunsets have a yellowish greenish tinge lately but we have had so much rain lately, cloudy skies all the time. YOur grandbaby looks like a healthy baby boy! How precious great grandma got to meet him too! Love the pic of the dust storm...and the one of your Mom and Teddy! Your books are beautiful!!! I hope your Christmas sales will be through the roof! Ooh! You've got a Canon! Lucky girl. It should be great for birding, especially if you have other lenses.I really need something more sophisticated to get the ducks! Lovely pic of your mother and The New Man. Fabulous picture, Carol. I hear some of the dust is coming this way - I hope I'm too far south! One day, I would love to fondle your books in person!! For now, just with my eyes. Nice post as for me. 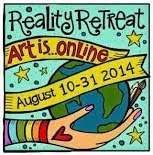 It would be great to read a bit more about this topic. Thank you for sharing this info. Our grandbaby looks like a healthy baby boy! How precious great grandma got to meet him too!